The following excerpt is from my study titled The Holy Snakes of the Virgin Mary: Examining the Mysterious Annual Appearance of Snakes in Kefallonia. "In the middle of the month a horde of non-venomous snakes, unknown to science, embellished with black crosses upon their heads and skin like velvet, had wriggled out of apparent nothingness at Markopoulo. They had filled the streets with their writhing and creeping, had approached the silver icon of the Virgin, had installed themselves upon the bishop’s throne, and at the end of the service had disappeared as quietly and unaccountably as they had come." Such is the description of the annual appearance of the Holy Virgin’s snakes given by De Bernieres. It is a common description, yet not entirely true on certain fine points. One case in point is that De Bernieres chronicles this event to 1940, yet as was pointed out earlier, there was no such appearance in 1940. 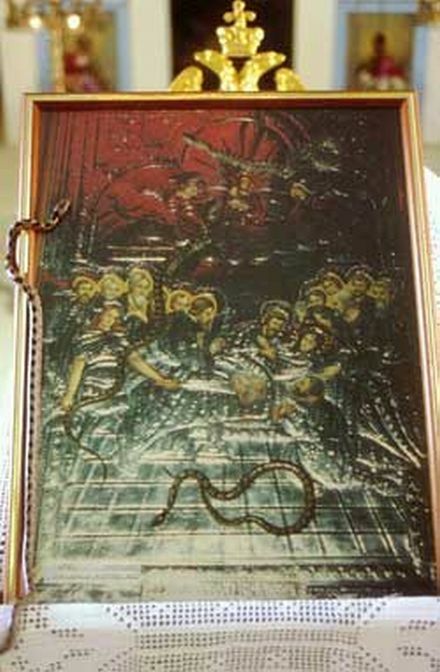 Another issue is whether or not these snakes are venomous; whether they are unknown to science or known; whether or not they appear only in Markopoulo or any place else on the island; and whether the crosses on the head and tongue of the snakes are black in color or, as reported by others, white. These are only a few of the typical contradictions and outdated information I encountered in my research that needed clarification. As a sign posted on the bell tower written in both Greek and English informs the visitor, the snakes of the Holy Virgin make their annual appearance at Dormition Church between the Feasts of the Transfiguration of Christ and the Dormition of the Theotokos from August 6th to the 15th. As the days close in towards the Feast of the Dormition, so do the number of snakes increase, until finally they disappear at the close of the Feast not to be seen until the same time next year. Where they come from and where they go after the Feast is unknown. Though Markopoulo is most famous for this phenomenon, it is not the only village in Kefallonia where this occurs. A little further up Mt. Ainos is another small village called Arginia. During this same time, from August 6th to the 15th, snakes appear in that village church as well with similar type festivities, since the church there is also dedicated to the Feast of the Dormition of the Theotokos. The church is built next to the village’s natural water spring. In fact, many of the pictures of the snakes posted on the internet and circulated are the ones that make their appearance in Arginia. Scientists who have tried to unravel the mystery of the snake’s appearance believe the wet damp route that runs from the fresh water spring in Arginia down the ravine to Markopoulo is a migratory path for the snakes, though there is no evidence for this. It could just be that they have their nests there year around. The church of Markopoulo is built in the depths of a ravine. The bell tower on the other hand stands away from the church next to the street. It is very old with a strong foundation, grey in color and eroded by time, full of holes at its base. The style is Venetian, and the bells are unique to the island, jumping when they ring. It has been observed the snakes first emerge through the holes created for the bell ropes and those at its base. For this reason, some consider it a miracle the bell tower did not collapse during the great earthquake of 1953, being that it is from where the snakes emerge. "Today you don’t see as many snakes crawling around on the ground. The pilgrims simply pick them up before they reach the church, but in earlier days when there were more snakes and less pilgrims they had plenty of time to crawl into the church and honor the icon. The snakes used to be more numerous than today, especially before the Second World War, I don’t know why. Some years they did not appear at all. These were bad years, such as the year in which the Germans exterminated all the Italian soldiers that before had been their allies. It has always been a bad sign if the snakes do not appear." The excited tourists prevent the full experience of the miracle from being realized these days. Today, it is common on the 6th of August to see the locals search for the snakes throughout the night with flashlights. Before the snakes even enter the church, the faithful take them and bring them to the icon and to the bishop as well. The locals say they do this to prevent them from being trampled on by the excited and numerous crowd that is unfamiliar with them, and also of course to receive a blessing. Whereas in the olden days the snakes preferred to stay in proximity to the icon, today the faithful prefer to handle them, since they are harmless and serene, and be photographed with them. When the service ends, it is customary that wherever the snakes are picked up from initially, there they are returned. This is repeated every day until the 15th. Pilgrims are always amazed how friendly the snakes are and how at home they are in the church amidst the crowd. The snakes have no fear during these days. They are small in size (no more than three feet in length), adorable, calm, harmless, and bear four mysterious dots in the shape of a cross on their head as well as the tip of their narrow tongue. Some wrap around the wrists, shoulders and chest of young and old alike, where few even allow them to enter their sleeves and escape through the other side. Others decorate the icons of the church, the crucifix, and even the bread offerings used during the services, with their presence. And, as mentioned earlier, they climb up the bishop as well as the priest who reads the Gospel as if they also are participating in the celebration. The atmosphere is reminiscent of the Garden of Eden, when the first formed man and woman lived peacefully with all the wild animals. One local priest relates how many people have searched the entire island for these snakes, but they cannot be found at any time of the year. Other snakes are found, but not these. A fork off the main road of Markopoulo leads to Mt. Ainos. The road passes through the village of Kolaiti with its astonishing view of the sea, and, a little further up is Arginia. The road from Arginia leads to a plateau in Ainos where the charming Zoodochos Pege Monastery is located. Arginia is a popular stop due to the cooling moments offered by the tall plane trees that shade the village’s natural water spring. Markopoulo suffered the most damage overall on Kefallonia in 1953. Interviewed in the documentary Holy Snakes of the Virgin Mary (International Vision Production). Also, a few snakes are usually placed in jars for the ten days to avoid anyone from taking, killing, or stepping on them.